Residence Inn Calgary Downtown/Beltline District has opened. The Residence Inn Calgary marks the 800th hotel for the brand. The property’s studio and one-bedroom suites have dedicated living and sleeping areas as well as fully equipped kitchens. Additional amenities include complimentary grocery delivery service and daily hot breakfast; a 24-hour market; a common laundry room; a 24-hour, bi-level fitness facility; market; and valet parking. For guests seeking a full-service dining experience, the property’s lounge and terrace offers light meals complemented by regionally-infused crafted cocktails, West Coast wines and local beer selections. Just in time for summer, the property will soon unveil a wine bar in its lobby. The property also has close to 6,500 sq. ft. of naturally-lit meeting space with built-in multimedia technology. Groups of up to 175 can take advantage of flexible meeting rooms and dedicated gathering spaces for meals, breakout sessions, one-on-one meetings, and more. 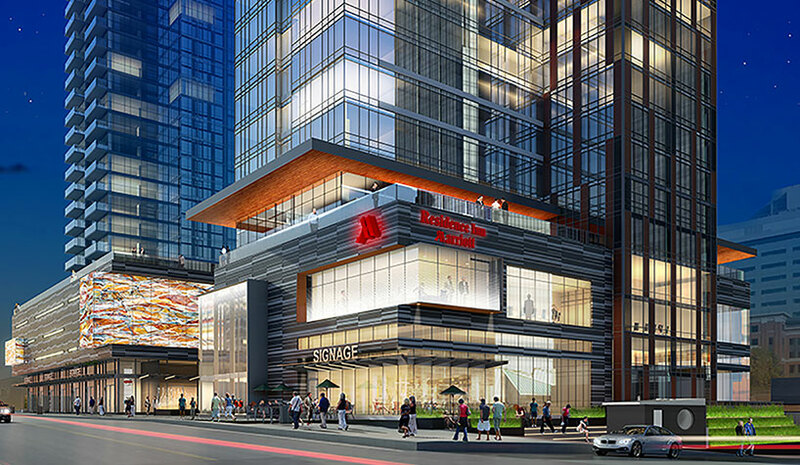 The 154-room Fairfield by Marriott in downtown Montreal has opened. The hotel will operate as a Marriott franchise, owned and managed by Sunray Group of Hotels. Inspired by nature, the hotel’s rooms and suites place the living and working area near the window to allow for more natural light and views. Building on this natural design, the room decor has organic patterns and fresh colors, blending wood tones with bright pops of color. The new design also places the sleeping area toward the middle of the room, helping to give guests a better night’s sleep on plush mattresses, as well as easier access to the bathroom and wardrobe. The bright, spacious living area also offers a comfortable couch, refrigerator, coffeemaker and microwave. Additional hotel amenities include a fitness center, valet laundry service, complimentary WiFi, as well as fax and copy services. The hotel also offers 460 sq. ft. of meeting space to accommodate functions of up to 12 people. OPUS Hotel Versante is expected to open in Richmond, British Colombia in early 2020. The property will have 100 luxury guestrooms and suites with spa bathrooms; an outdoor pool and jacuzzi; a 12th floor bar with afternoon tea, evening cocktails and live music; a ground floor signature restaurant; on-property function space for up to 200 persons, as well as exclusive access to Club Versante’s private meeting and event spaces; and more.